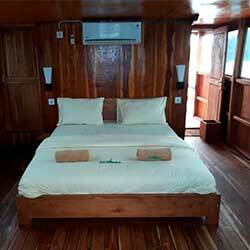 Around 08.30 we wait for you at the hotel lobby in Labuan Bajo (Flores) to take you to the pier. 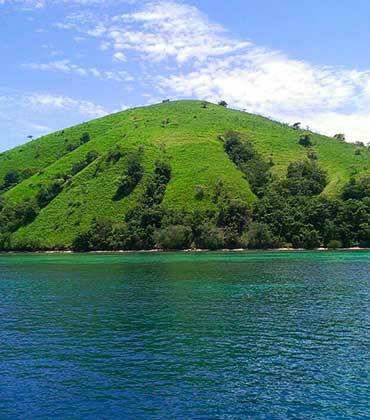 The first stop is on the island of Kanawa where you can walk along its beach and enjoy snorkeling. 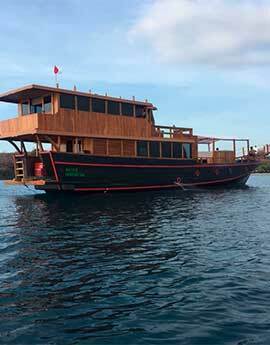 If you prefer, you can go to visit Seraya and Sabolo, for good snorkel too. Afterwards, you will go sailing to see thousands of bats that come out at sunset in search of their dinner. The pink color sky, turns a bit black with all the bats that undertake their flight to other islands looking for fruit trees. Around 05.30-06.00 you will have the breakfast and the boat will go to Komodo where you can do a trekking to discover the island and the dragons. After that, you will go to Manta Point, where you can normally see Mantas. The next stop is going to be Pink Beach, where you can enjoy the pink sand. Tonight, you will sleep in Padar. After breakfast you will hick Padar Island to see the famous view of the 3 beaches. After, you can make the last swim in the area before going back to Labuan Bajo. All the meals detailed at the itinerary. Water, soft drink and juice in the morning. Transfers to the port from airport/hotel. Our itinerary is flexible. We adapt the route to your needs. 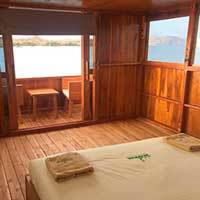 Our idea is combine the best diving with the essential visits to the Komodo National Park, but we need to explain that it is a lifeaboard, with a minimum of 3 days that is not 100% focused on diving, but rather a mixture of both. 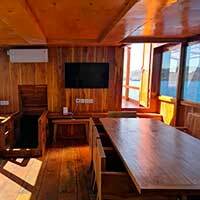 Our boat is built in 2018, has a length of 29m and consists of only 2 rooms and a suite with terrace. The days of travel and the areas to visit or to dive, are variable to suit the client, so when you contact us, we will agree itineraries and days, as we are fully adaptable. Contact us, explain your ideas and for sure we can make them come true. Rutas is the best option. I recommend it. Excellent price, quality and human warmth. I would choose them one and a thousand times more. We spend our honeymoon in Indonesia, visiting Bali, Java, Gili Trawangan, Komodo and Nusa Penida. The truth is, we had an amazing time. The experience with Clara was great. A super nice girl who helped me a lot choosing sites and hotels. I would not hesitate to go with them on another trip. An excellent experience. The trip was very well organized, especially for us, support of the local guides, Dedi in Bali and Dafry in Komodo was great, they have been aware of any need and concern that has arisen and have shown us places, customs. The two days by boat are highly recommended, the boat crew great. Many thanks to Rutas Indonesia (Fran and Mikael for the help in the organization). I'm sure we will repeat!!! We are a couple with an 11-year-old girl who just returned from a 17-day trip through Indonesia. The experience with Rutas Indonesia, highly recommended. That everything works like a clock in this type of travel is surprising. The phone to contact Clara at any time gives a lot of peace of mind. 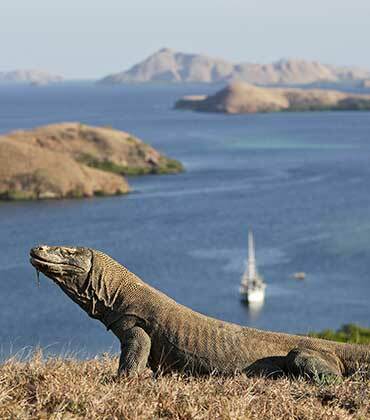 What to do in Komodo? In the landscapes of the volcanic islands of Flores you will find many exotic plants and animals. The most famous species is the Komodo dragon, the largest lizard in the world and you can only see in this small part of the planet. 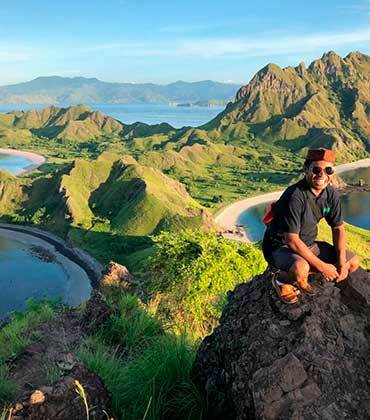 The trekking is definitely one of the best things we can offer you in the Komodo Islands to contemplate the natural beauty from the top of the mountains to the bottom of the sea. You will have the opportunity to see impressive landscapes and make a healthy and regenerating hike. A perfect place to swim with sea turtles and the Manta Rays in their natural habitat and meet curious giant fish. 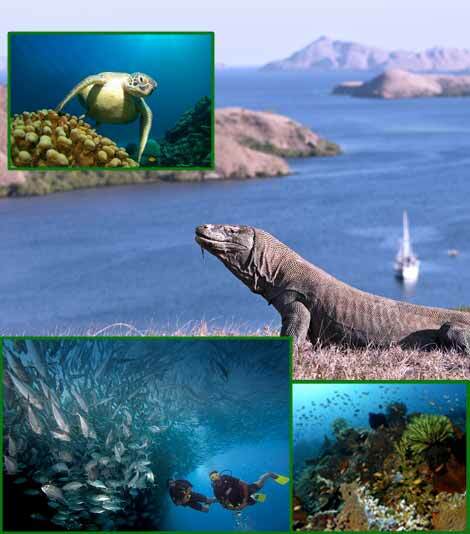 The natural park of Komodo is huge and there are different dive sites that are simply the doors of a wonderful world full of amazing creatures. Among the small islands and bays of the Komodo natural park there are beaches for all tastes. Among them is a surprising beach where its sand is pink, the Pink Beach. Its unique color is caused by the mixture of fine white sand with small pieces of red coral brought by the waves. We take you to see the dances of thousands of bats that come out of their caves at sunset to look for food. A surprising spectacle of nature that is repeated every day and mixed with the beauty of the warm colors of the sky when the sun goes down. 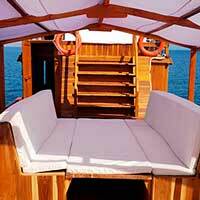 At the traditional Phinisi boat you will have all the amenities that you need to spend one or nights. Also, you will enjoy our chef delights and relax on the deck reserved only for you. You can see there the available dates.